‘VICTORIA’ trip boat at Chelmer and Blackwater Navigation Boat TripsStep on board Victoria and enjoy a cruise along the glorious Chelmer & Blackwater Navigation in Essex with Chelmer Cruises. The Navigation offers nearly 14 miles of waterway to explore. A typical trip would be a 2 or 3 hour cruise from the vessel’s base at Paper Mill Lock. Much of our wonderful waterway runs through tranquil Essex countryside, and is the perfect place to go for an afternoon cruise. Victoria is perfect for weddings, parties and group outings. The boat can accommodate up to 48 guests and includes a qualified skipper and crew. Charter trips can be arranged for any day of the week, with timings to suit hirers. The minimum hire period is 2 hours. The vessel is wheelchair and pushchair-friendly, and we can provide food and drinks on board. A licensed bar is available. 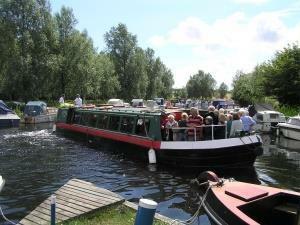 Step on board Victoria and enjoy a cruise along the glorious Chelmer & Blackwater Navigation in Essex with Chelmer Cruises. The Navigation offers nearly 14 miles of waterway to explore. A typical trip would be a 2 or 3 hour cruise from the vessel’s base at Paper Mill Lock. Spending time by the water is the fastest way to slow down, so perhaps just take a moment to sit back and enjoy our fantastic waterway. Private Hire - depends on location, duration etc - please ring Sue on 07507 055021. Public trips - full programme with prices available soon on our website.